Comedian Will Ferrell somehow ended up being one of the most prolific stars to appear on the HD DVD format (challenged only by Gerard Butler). It's somehow fitting that my last review on this now-expired format would be yet another one of Ferrell's releases. At least it has some things going for it, despite relying on rather obnoxious attitudes for the bulk of its attempts at humor. 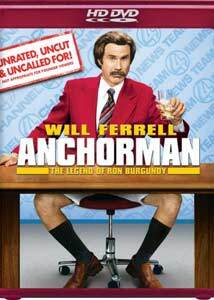 The story centers on anchorman Ron Burgundy and his small empire at a television station in San Diego during the 1970s. Burgundy is an egomaniac, a role that Ferrell excels at, surrounded by ladies' man field reporter Brian Fantana (Paul Rudd), overly jocular sportscaster Champ Kind (David Koechner) and imbecilic weatherman Brick Tamland (Steve Carell). Things get turned upside down, however, when station manager Ed Harken (Fred Willard) shakes things up by adding Veronica Corningstone (Christina Applegate) as Ron's co-anchor. Soon the sexism of the men creates problems, while Corningstone tries to get the anchor position all to herself. At the same time, both she and Burgundy are angling for a network anchor job. The main problem with this movie is that it's an extended joke about sexual harassment, and while the men make themselves ridiculous (most amusingly countered by Applegate sweetly reminding them, "You know, I'm right here. I can hear you,") it doesn't really seem to know what to do with it. A forced romance between Burgundy and Corningstone doesn't help redeem matters, since the continually oblivious Burgundy never really changes and it's hard to see what on earth she might see in him. Unlike most Ferrell movies, however, there are actually some laughs here, thanks primarily to Steve Carell's inspired portrayal of Brick Tamland. He frequently provides some great non sequiturs, delivered with vacant aplomb, that make the movie worth watching. A wide array of comic cameos are also frequently entertaining, starting with an uncredited Vince Vaughn's role as demented rival anchor Wes Mantooth. His shiftiness and nasty undertones (emphasized by a surprise deleted scene) is a lot of fun, as is Jack Black's brief appearance as a biker who punts Burgundy's toy dog off a bridge. It's too bad that this movie doesn't work better; the Burgundy character is a fairly solid one, very well suited to Ferrell's talents, but the material doesn't give him anything very funny to do. As Ferrell movies go, it's not as painful to sit through as most, but it's not exactly entertaining either. Image Transfer Review: The HD picture is rather disappointing, with quite a bit of digital noise reduction resulting in smearing and lack of fine detail throughout. In fact, many of the standard definition clips in the bonus section look nearly as good as the main feature, although the movie does have much better color definition. At least there's minimal edge enhancement to try to make up for the DNR-induced softness. Audio Transfer Review: For the most part, the audio is rather nondescript, although clean and without major problems. The highlight is the guys' a capella rendition of Afternoon Delight, which on careful listening provides extremely precise placement of the voices in the sound field. There's a nice attention to detail here that is very pleasant. The sequence in which Burgundy plays jazz flute in a club has nice presence and the vibrato in the flute comes across well. But otherwise it's hardly a showcase. Extras Review: An array of over half a dozen featurettes and gag materials start off the extras, with a fairly generic EPK-style Making of Anchorman (9m:28s) being the weakest of the bunch. A Conversation with Ron Burgundy (10m:40s) allows Ferrell to ad lib like crazy in character, and it's far more amusing than anything he gets to do in the movie. Similarly, there's a gag audition by Burgundy for ESPN supposedly from 1979 (1m:54s) in which he fails to recognize what the network would become. Ron Burgundy Exclusive (8m:29s) and Ron Burgundy at the MTV Movie Awards (3m:36) give him more opportunities to play around with the character, in the latter making a fool of himself with Rebecca Romijn-Stamos. Commercial Break (2m:03) provides a brief bit of behind-the-scenes footage. Champ Kind gets his own in-character moment in Special Report (6m:44s), as he requires a multitude of takes to get a simple line right. Afternoon Delight is the squirm-inducing highlight of the 1970s-heavy soundtrack, and it gets its own music video on the disc here. A reel of bloopers (7m:45s) is fairly standard material with plenty of goofing up and goofing around on the set. Do you like deleted scenes? You've come to the right place, with a whopping 35 scenes included here, ranging from the very funny to the dim, plus a couple of screwed-up lines. Alas, nothing but the movie itself is presented in HD, but there's not a huge difference in the picture between that and the SD excerpts in the bonus materials. Finally, there's a jovial full-length commentary that's packed with participants who drop in and out. In fact it's almost overstuffed, but there is plenty of back and forth with the very occasional tidbit. It's enjoyable in its own right, but don't expect a lot of technical information. Despite their reveling in this being the unrated disc (and the unrated commentary) there's a lot of bleeping of the ridiculously lewd language (especially thanks to Carell, who displays an incredible pottymouth). For some reason, Lou Rawls appears too, unclear as to why exactly that happened but he takes part like a good sport. Say goodbye to HD DVD; the bonus features are at least as amusing as the picture itself, so if you can find it at a discount it's not a terrible addition to your collection if you like Ferrell.